I received this beautiful Kenyan coffee by post directly from Roger Wittwer, the head roaster of Kafischmitte, because of a game on Facebook. And first I want to say thank you, Roger! I fully appreciate it and on top of that the coffee is damn good! Kafischmitte know the coffees from Karimikui washing station quite for some time and finally they get this wonderful peaberry into their assortment. 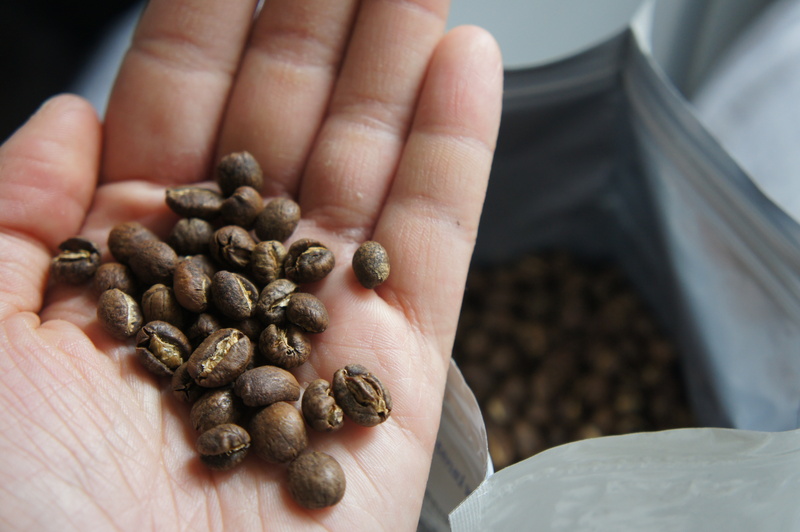 The roast is still on the lighter side, optimized for filter coffee and I as one self-respecting brewer, tried it with as many methods as I could. The first thing that comes to my mind when I smell the coffee is dried fruit and especially raisins. It has also very nice berry flavors and for my surprise – milk chocolate. Normally from a Kenyan coffee I would expect something crisp and with a pronounced acidity, but this is very balanced coffee. The mouthfeel is smooth and after several tries of mine, where I extracted some unwanted flavors in the cup, I can say that the coffee has a very pleasant, lingering finish. Absolutely great! Very nice content. Glad I had part in the inspiration. Now I can keep up with international quality roasters. Hope to see more, Elena. Aw, thanks Mauricio! There will be more I promise!